Hi friends–after a brief break we are back…happy 2012! As you know, over several weekends in November and December 2011, the Birmingham Home & Garden Inspiration Home we designed was open for tours. The home was also photographed for this month’s issue of the magazine, which is on newsstands now. Designed in conjunction with architect Chris Reebals of Christopher Architects, the home turned out beautifully. We furnished it with a combination of pieces from our own shops and items gathered from various sponsors around Birmingham. We are so grateful to the many shops who loaned pieces for us to use in the home–and we’re proud that we were able to showcase what a great resource Birmingham is for furnishing a home! As we share photos of the home over the next few days, we’ll attempt to point as many of the sponsors as we can. Want to see the amazing photos our friend Jean Allsopp took of the home? We are thrilled with how they turned out. In the Living Room, a flatweave rug from Paige Albright Orientals was placed over Peacock Pavers on the floor. The linen sectional sofa (we love the squared high sides) is a Bernhardt piece from Dwellings. The tall wingback chairs from Birmingham Wholesale Furniture compliment the high window–which we painted Benjamin Moore ‘Black’ for contrast. 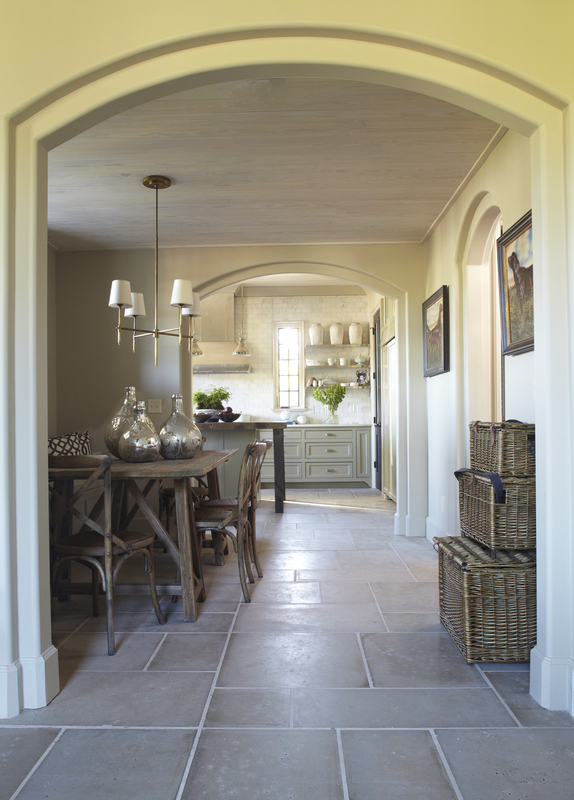 The walls are Benjamin Moore ‘Grant Beige’ — one of our favorite paint colors. 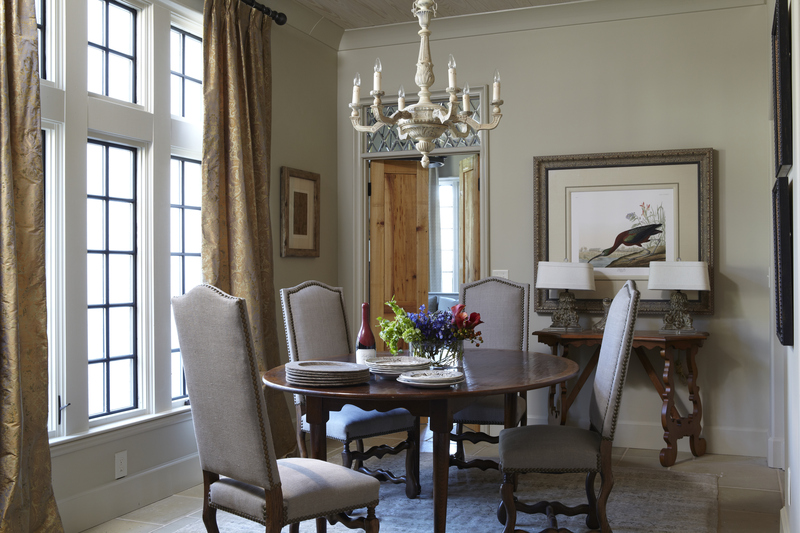 The chandelier and sconces are Visual Comfort–also in dark bronze to add contrast against the linen colored walls. The cowhide-upholstered ottoman and the fun pillows are all available in our Mountain Brook shop. 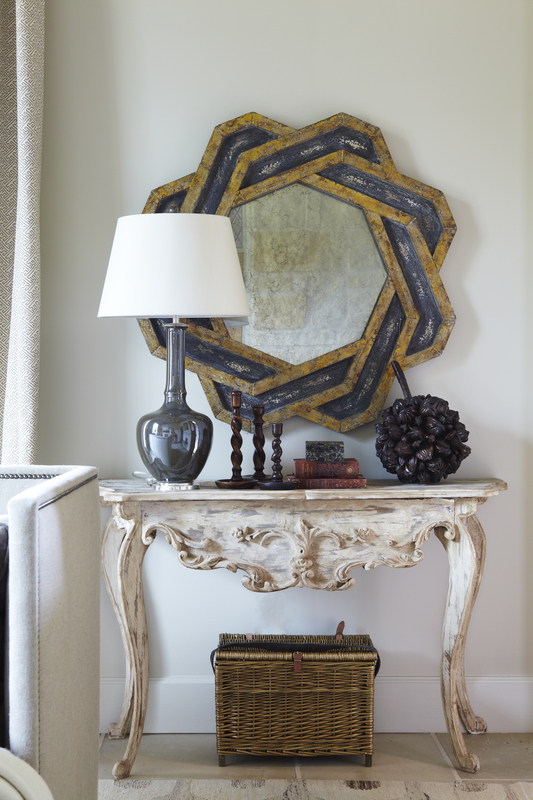 The combination of these curvy demilune consoles from Mulberry Heights with charcoal grey glass lamps from Birmingham Wholesale Furniture and black and gold tole-painted mirrors from Iris & Co was one of our favorite parts about the Inspiration Home. A view from the Living Room through the Breakfast Room and into the Kitchen of the Inspiration Home. 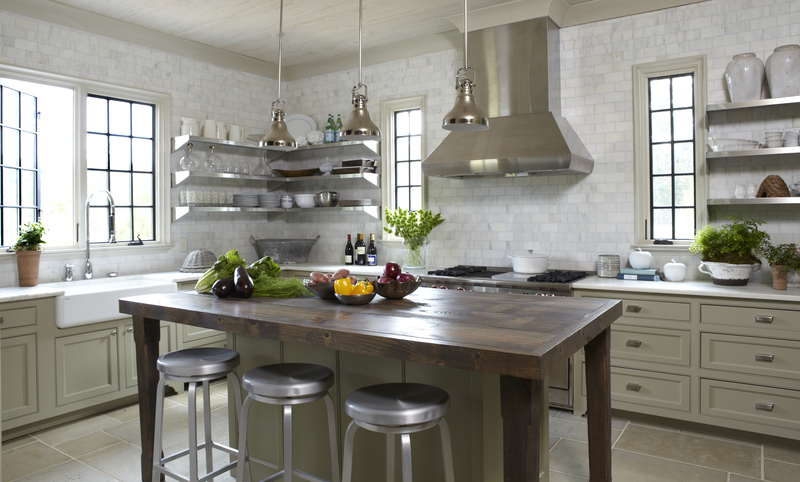 The Inspiration Home’s Kitchen was one of our favorite spaces. Tiled from countertop to ceiling with 3×6 ‘Alabama White’ marble tiles from Triton Stone Group, the design of the room recalls working cook’s kitchens of the 1920’s. We had the inset maple cabinetry painted in Benjamin Moore’s ‘Nantucket Grey’ an herbal color that blends beautifully with all of the marble and stainless. The island is topped with white oak planks harvested from trees downed during the April tornadoes that so severely effected Birmingham. Wolf and Subzero appliances throughout. The open shelves are accessorized with a variety of white pottery, dishes, and glassware–utilizing a clean and common color scheme helps keep open storage from becoming too busy. In the nearby Dining Room we placed linen chairs around a beautiful oval table from The Nest. If you visited the Inspiration House while it was open for tours you might not remember these chairs–we had originally selected them at Mulberry Heights to go in the House but they sold before we could install the interiors! Thankfully our friends at Mulberry let us borrow them just long enough for the photoshoot. The white linen chairs in the house during the tour were from Tracery. Doesn’t the antique wood chandelier from Baker Lamps & Linens blend beautifully with the whitewashed wood ceilings? In a room that has primarily sheetrock surfaces, details like a planked wood ceiling can add so much. Rounding out the first floor (excluding the Master Bedroom, which we’ll share soon!) was a beautiful and cozy Study. We had the Study walls planked in horizontal wood planking which is washed in a half paint/half water mixture. 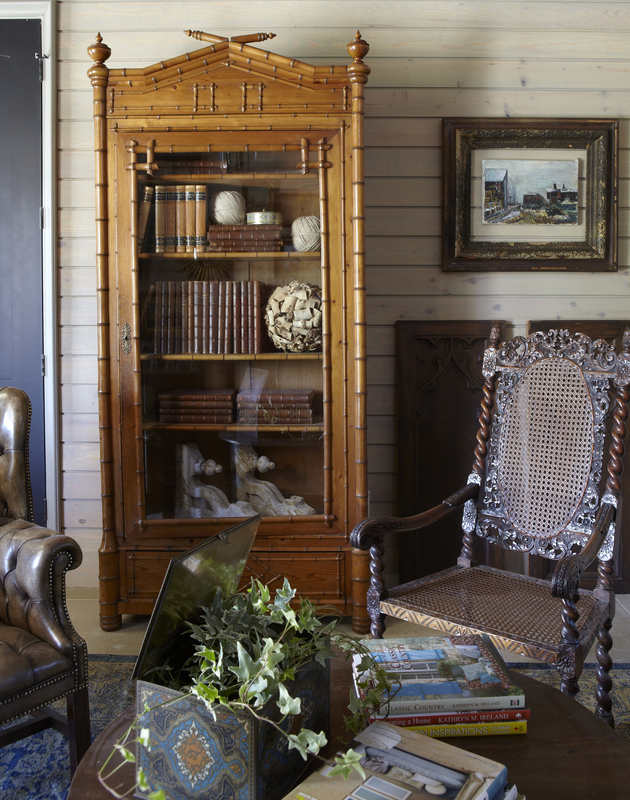 Front and center in the room is a dramatic and unusual cabinet from the always amazing Henhouse Antiques. Check back soon, there’s more to come. Three more bedrooms plus the amazing Master Suite…a cozy upstairs Kids Den and an amazing Porch space. This entry was posted in our work and tagged Birmingham. Bookmark the permalink. *** Welllll, I like this SOOO MUCH that I put it on as my new “SCREENSAVER”… problem is, I keep coming back to look at it instead of reading MORE of today’s e-mails!!! Something about it just SPEAKS to me, and I sure like what it’s SAYING!!! I love the kitchen!! Great job! Beautiful! I really enjoy the overall color palette and thank you for including all of the supplier information as I am especially loving the paver flooring! I love your design. Is there a way for you to make your pictures less “big” so they will load faster? Thank you. Peg–we try to strike a balance between images that are small enough to load efficiently and large enough to allow for saving and re-blogging/adding to Pinterest. Apologies if our site is not working as well as intended for you…these images are a little larger than the ones we typically upload. They are fantastic to see. Thanks for your reply. Your team does such a great job implementing your specific style! It has become very recognizable. If any of you ever make it to Austin let me know, I would love share stories about the business of design and retail! It’s gorgeous!!! Wish I could see it in person! Hi all – just discovered your blog! What beautiful rooms!! I have been a fan since the first photo I saw of one of your rooms and you have not let me down with your consistent but unique style. You guys do amazing work!! I will link to you so I don’t miss another post. The kitchen is fantastic! i love the open shelving.